Another platform exclusive stage has been announced for Super Smash Bros.. Yesterday we saw the unveiling of a Star Fox themed stage for the Wii U version of the game, and today we have one that’s exclusive to the Nintendo 3DS edition. It’s a Tomodachi Life stage, and it looks ridiculous. The reveal came by way of the now more than standard daily Miiverse posts from Director Masahiro Sakurai. This is the blurb he included with the image you see above. This is the Tomodachi Life stage that’s exclusive to the 3DS version! 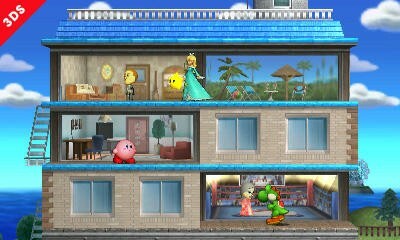 The front walls of the apartments disappear so you can see the area within when a fighter overlaps with the room. The rooms are randomly placed and selected from among several types. Planting an X Bomb behind a wall might be an effective tactic. Pretty sweet. He then took to his post’s comment section to add this image and the subsequent blurb. You might run into a Mii living in the room! 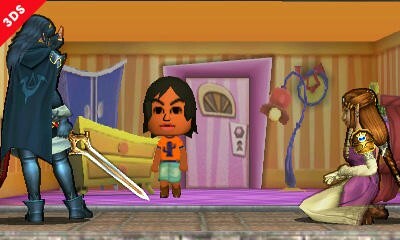 The Mii characters are taken from the data in your 3DS system, so you could find your friends living in the apartments. That bit is amazing. All the ridiculous friends and Miis I’ve stored over the years will watch me tangle in Smash, and I think that’s ridiculous. Of the exclusive stages revealed so far, this Tomodachi Life themed area might be my favorite. The 3DS version of Super Smash Bros. will release on Oct. 3. The Wii U version is still set for the holiday this year.